FNSS, continues to be the first choice of the armed forces of various countries, due not only to the high performance of its products, but also its contributions to the development of local industries. Aiming to expand its user base, FNSS will showcase the PARS III 8x8 and PARS 4x4 Wheeled Armored Vehicles (AMV) and the KAPLAN-20 New Generation Armored Fighting Vehicle (NG-AFV) at Eurosatory 2018, which all been developed to meet a broad range of operational needs. FNSS stands out as a company which can offer complete solutions both to armed forces that wish to procure the best available land platforms, and to countries that are seeking to develop their domestic industries. FNSS platforms and weapon systems meet the most stringent of requirements, practically setting world standards of their own, while its broad experience in collaboration and technology transfer is allowing it to acquire important work shares in projects in which users seek to promote the development of their own local industries. Having delivered 133 ACV-15 vehicles to the UAE, FNSS continues to carry out the maintenance and management of these vehicles through its UAE office. FNSS forged its first relations with Malaysia through the ACV-15, and under three separate orders Malaysia purchased a total of 267 ACV-15s & ACV-19s in different configurations. The project also involved the transfer of technology and the final assembly of some of these vehicles – designated ADNAN by the end user – in Malaysia. When the Royal Saudi Arabian Armed Forces considered the modernization of different types of M113 Armored Personnel Carrier, FNSS not only offered them an effective solution, but also implemented it by assuming the operation of the Al-Kharj maintenance and repair facilities belonging to the Royal Saudi Arabian Armed Forces. Within the scope of successive contracts that involved three phases, FNSS modernized over 1,000 M113’s to the M113A4 level. Pleased with its ADNAN tracked armored vehicles, Malaysia also selected FNSS for the development and local production of wheeled armored vehicles, purchasing a total of 257 AV8 GEMPITA platforms in 12 configurations, based on FNSS’ PARS family of vehicles. Benefitting from the experience it gained with ADNAN, the Malaysian industry (DEFTECH – DRB-HICOM Defence Technologies) assumed the role of prime contractor in this project. 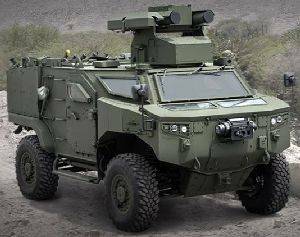 Following the Malaysian example, Oman also selected the PARS product family to meet its wheeled armored vehicle requirements. Currently preparing to deliver a total of 172 vehicles in 13 configurations to Oman, FNSS will also provide local solutions to the vehicles’ life cycle support and management requirements. While 145 of these vehicles will be PARS III 8x8 platforms, delivered in eight different configurations, the remaining 27 will be PARS III 6x6 platforms, and will be delivered in five different configurations. In line with evolving concepts of warfare, Indonesia identified a requirement for a medium-class tank. FNSS and its local partners jointly developed the KAPLAN MT, which is currently undergoing qualification tests. A common feature of FNSS’ activities in these countries is high user satisfaction, and the frequent follow-up of the initial contract with new contracts. This has led FNSS’ business volume outside Turkey to pass the $2.6 billion mark.